Interspecies transplants are closer than ever before. Researchers have made a significant breakthrough in the area of organ transplants, and it brings us remarkably close to being able to safely transplant organs from other species into humans. In this latest work, scientists are working specifically with pig organs. Notably, teams have been working on interspecies transplants for decades. One of the concerns that halted the previous studies was the 1998 discovery that retroviruses were hiding within pig DNA, which could possibly pose a threat to human recipients. To combat this threat, a team from Harvard University and a private company, eGenesis, just created gene-edited pig clones that are completely free of the aforementioned retroviruses. Now, without the threat of these hidden diseases, it may be possible to safely transplant pig livers, hearts, and other organs. This adds to the growing number of transplants that are already in relatively widespread use in medicine (heart valves, skin grafts for burn patients, etc.). 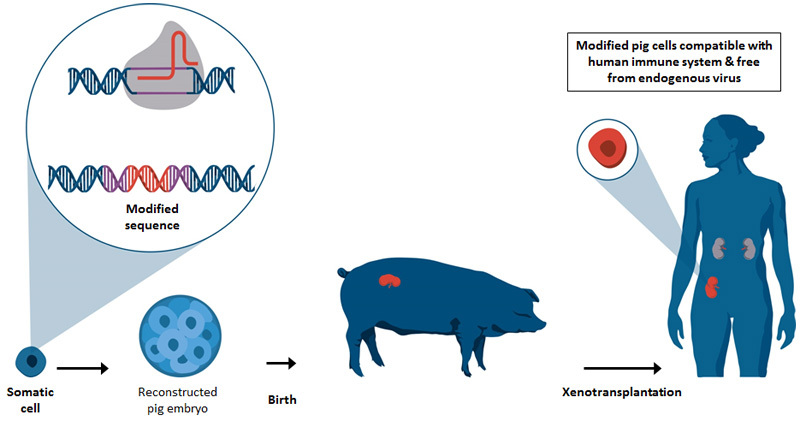 Ultimately, these genetically altered pigs could be raised specifically for the harvesting of organs for transplant. Aside from contracting rare diseases from pig organs, there is the ever present threat of organ rejection—even when the transplanted organ originated in another human. Scientists have been working tirelessly to reduce the probability of this occurring. Emerging technologies, like the CRISPR-Cas9 system of gene editing fame, are getting researchers closer to rejection free transplants. In fact, a team of scientists from the University of Alabama at Birmingham recently engineered pig organs that are free of carbohydrates, which typically make the organs targets for rejection. There are also researchers studying the ability to bioprint completely new organs, tissue, and bones for transplant. Many of these technologies utilize the patient’s own cells to significantly reduce the risk of rejection. Coupled together, these advances could usher in a new golden age in human health.